Firm up your figure with a revolutionary skin treatment that will dramatically stimulate collagen production, to instantly tighten up your skin. Laser skin tightening is indeed the safest, most advanced and effective non-surgical option to defy aging. Laser for skin tightening can address lax skin on your face, stomach, neck, arms, legs and buttocks. This technique uses infrared laser energy to stimulate the skin’s natural regeneration of collagen through deep dermal heating. The higher the level of collagen in the skin, the smoother, firmer and more youthful your skin looks and feels. Opt for a nip and tuck without a cut with Laser skin tightening! The area to be treated will be covered with a cooling gel. 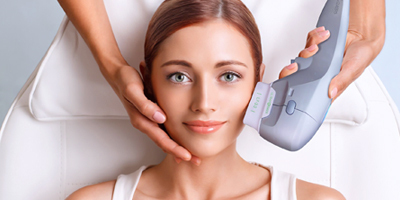 Your dermatologist will then deliver a very precise pulse of Infrared light to the target areas. This heats the deep dermis layer of the skin to stimulate new collagen production and promote tissue tightening through tissue coagulation. The risks associated with Laser skin tightening includes skin burn, warm or sensitive skin, changes in skin color and localized bruising. Most patients will begin to see and feel the results immediately following treatment. However, two to six treatments, typically spread out four to five weeks apart may be needed to achieve the maximum “wow” effect. The results are cumulative and your skin gets better with time. Sagging skin is an inevitable part of the aging process but that doesn’t mean you have to accept it. Seekers of youthful looks can now rejoice in this new innovative non-surgical procedure – Laser skin tightening. Laser skin tightening can refresh your skin and restore a youthful, healthy and firm appearance. If you are unhappy with loose or wrinkled skin, Laser skin tightening is the way to go.